Judy Pfaff (British/American, b. 1946) is considered a pioneer of installation art, and her current body of work is reflective of her ongoing exploration of place. Her photographs show a more literal exploration of this concept, showing direct representations of recognizable locations, while the three-dimensional collages and assemblages reflect Pfaff’s internal responses. Come What May is not only a reference to the coming of spring, but also to Pfaff’s creative process. Responding directly to a place, whether in Japan, Brazil, or Wyoming, Pfaff creates works intuitively, relying on an emotional, instinctive response to direct the formation of her work. The title reflects how she works as an artist to adapt, elaborate, and transform the various elements of a work as her experience with a place of reference evolves. While the works have an air of spontaneity, Pfaff’s visual vocabulary is consistent. Her dynamic sculptures contain forms and shapes that are repeated, creating imagery that is familiar yet new. 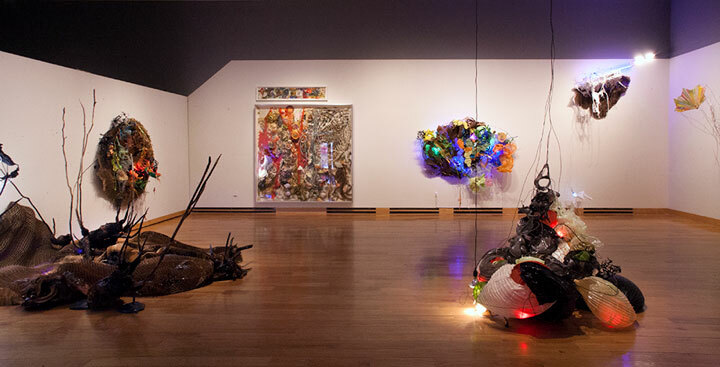 She incorporates found objects, plastics, cardboard, foam, and lighting elements to create pieces that are organic in form. Each of Pfaff’s works is a physical representation of her creative process. Pfaff received a BFA from Washington University, Saint Louis (1971), and an MFA from Yale University (1973). She has received numerous grants and fellowships, including the MacArthur Fellowship (2004), Guggenheim Fellowship (1983), and a National Endowment for the Arts grants (1979, 1986). Her work in is the permanent collections of the Museum of Modern Art, Whitney Museum of American Art, Brooklyn Museum of Art, and Detroit Institute of Arts. She is a professor and department chair at Bard College, New York. This semester, Pfaff is the UW Eminent Artist in Residence in the UW Visual Arts Department. Come What May was presented in conjunction with Pfaff's residency at the University of Wyoming as an eminent artist in residence in the Art Department during the spring semester 2013.